BETTER CHOICE PEANUT BUTTER SMOOTH is a natural butter produced from 100% peanuts. Product does not contain added salt, sugar or palm oil. BETTER CHOICE PEANUT BUTTER SMOOTH has a smooth, creamy consistency and excellent taste, thanks to a careful roasting process and many hours of grinding. 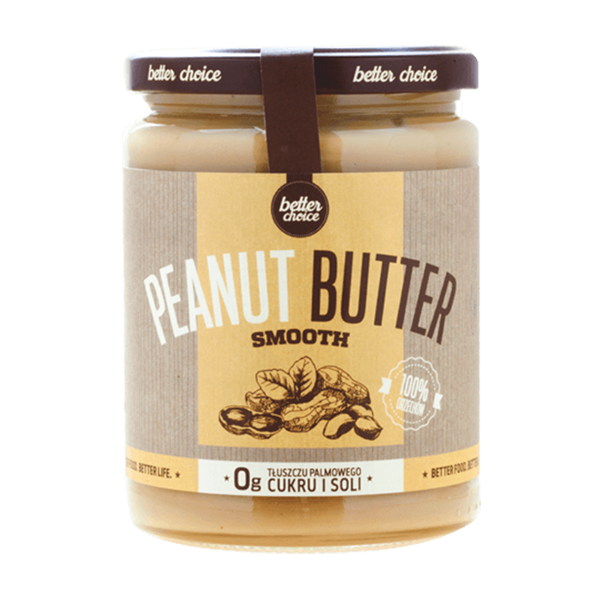 BETTER CHOICE PEANUT BUTTER SMOOTH is a 100% natural product, and may form layers. If you notice an oily layer on the butter, simply mix it back in before consuming. Not specified dosage of this product. WARNINGS: It may contain traces of other nuts or nut tree fruits. STORAGE: Keep this packaging tightly closed in a dry place, at the temperature of 15–25°C. Keep out of the reach of children. Protect from excessive exposure to sunlight. BEST BEFORE END, BATCH NUMBER, COUNTRY OF ORIGIN: See the side of the packaging.